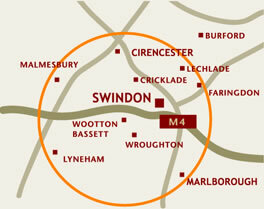 Pureheat offers a full delivery service up to 25 miles from our timber yard in Royal Wootton Bassett. Please see the map to the right for our FREE delivery area. For deliveries outside 15 miles and up to 25 miles, we make a charge of �15. If in doubt, please CALL US! We aim to deliver 2-3 days after we receive your order. We can deliver next day if possible but please call us. After we have received your order, we will contact you to arrange a convenient time to make the delivery, typically between 8am & 6pm, Monday to Friday. Saturday delivery requests are always popular, please order in plenty of time if you would like a Saturday delivery slot. 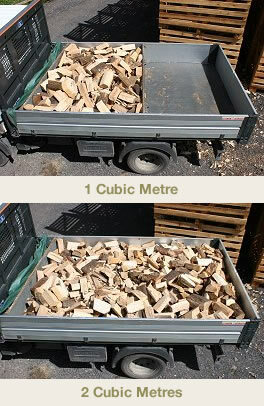 The picture shows one cubic metre of logs = half a truck load. Two cubic metres = a full truck load. How much is a cubic metre ? All our logs are sold by the cubic metre as a measured volume with the equivalent volume in nets The drier the wood the lighter it is and the better it will burn. Our logs are sold loose not stacked, a stacked cubic metre of logs will take up approx 2/3 rds of a loose cubic metres space. Once cut & split the logs are stored in one of our drying boxes designed to allow maximum airflow over the whole surface of each log aiding the seasoning process. After testing and conformation of the correct moisture content the logs are then tipped into one of our delivery trucks as a loose load and usually tipped again upon arrival at a customer?? ?s property. Our whole storage, seasoning and delivery process is therefore based on quantities of loose logs by the cubic metre. Be wary if you are offered a ton of logs, you may well be paying for water not dry wood. Standard builders bags also called dumpy or bulk bags are predominately designed to hold a ton of sand or gravel, these are not a full 1 cubic metre in volume and are most commonly 0.7 cubic metre. We deliver our logs loose in cubic metres and tip them as close as we can to your property or agreed delivery location. You don't need to be in when we deliver your logs but we can't tip logs on public pavements or heighways and leave them. We can stack your logs in your log store for an extra charge. Please call. Please see our terms and conditions for full delivery details.